Quilting Adventures: Take the long way home ....! What a busy weekend it was! 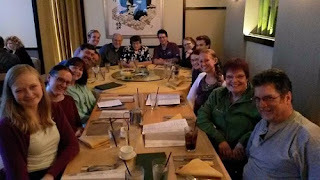 We headed out on Saturday morning to Massachusetts via Albany to attend my mother in law's 80th birthday dinner! My little Pumpkin works at a boy scout camp for the summer and we headed that way to pick her up. Although it is always fun to take a different route, it did extend our driving time by 2.5 hours. We left at 8:15 a.m. and arrived in MA at 4:15 p.m.
Now, I'm a big fan of sushi and apparently so is the rest of my family! So my niece, Michelle, ordered the Love Boat! Now that's heaven on a boat! Presentation is everything ..... this is the best I've seen so far! It was all so yummy! A great time was had by all of us. We returned home, via the long way again, Sunday morning as Pumpkin needed to be at work by noon. Although I enjoyed seeing everyone, by the time I arrived home I was beat! That is quite a drive, too bad you couldn't stay longer. What part of Mass are they in? What a great surprise that was! I love a good road trip. That's a lot of driving -- but it looks like it was all worth it!!! Yay for Road Trips -- AND Birthdays!! !